We have delved into the game of Sic Bo and it’s basic betting forms and we have also reviewed three available variants online by Microgaming, NYX Interactive, and Playtech to see how they compare with one another. Sic Bo isn’t as common as blackjack and poker in the online world of table games but it is still a game worth playing if you know where to find it on the Internet. 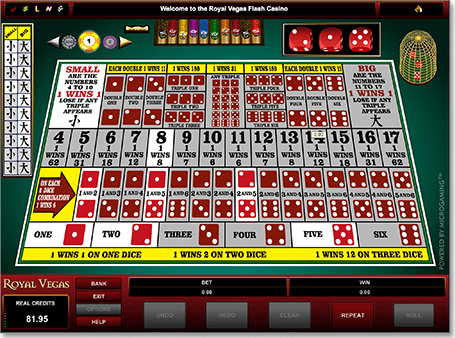 All players have to do is roll three dice after placing a wager on their preferred bet located on the betting layout. Top leading software developers have produced some basic variants which mimic the land-based casino game, with Microgaming leading the way on this front with a nice RNG version. Sic Bo, sometimes referred to as Big and Small in Westernised culture due to the bets involved as discussed below, is a game played with three dice and said to originate from China. It then slowly migrated throughout the rest of Asia until it found its way to North America where it is still quite popular. The name means ‘precious dice’ which is quite fitting since the game relies on what the outcome of the combined total of the dice will be. The game is still played fervently in China and maybe more so than anywhere else in the world, but players can still find the game online with the simplistic nature of the game making it an easy and nice change from the more common Internet casino games. Microgaming has even released a version of live dealer sic bo. Sic Bo is a game of chance and is said to hold similar traits as the game of roulette. Basically, all you have to do is guess what the total of three dice, numbered one to six, will be when rolled. There are a number of bets which can be made in a game of Sic Bo, similar to playing roulette. Small – By betting small in a game of Sic Bo you are wagering that the total of all three dice will amount to more than four but less than 10 and that none of the individual dice will have an identical number. This bet pays 1:1. Big – This bet and the aforementioned bet gives away why the game is sometimes called Small and Big (however it could also be because Sic Bo starts with S and B as does small and big, but we will leave that debate for another time). This bet is the same as the small bet but you are wagering that the total of the dice will be more than 11 and less than 17. This bet also pays 1:1. Odd or even – With this bet, it is almost a 50/50 chance as you are betting whether the total number of the dice will be either odd or even, however you are also betting all three dice will not be identical. Regardless, it still pays at 1:1. Number – This bet is simply picking the exact number the total of all three dice will be. The pay out for this bet can vary depending on the number you pick. For example if you pick four or 17 as the total you will be paid 62:1, the highest payout for this best, while if you pick 10 or 11 you will be paid 6:1, the lowest payout for this bet. Double or triple – With these bets, players are wagering on the fact that either two or three of the dice will reveal identical numbers when rolled. The double bet is known as specific doubles and pays 11:1, while a triple bet can exist as a specific triple bet which pays 180:1 or any triple bet which pays 31:1. A specific triple bet means the exact number while an any triple bet means you are placing a bet that any triple regarding the number will occur. Two of three numbers – Similar to the double or triple bets, however players are betting on the exact two of three numbers which will be rolled. The payout for this bet is 6:1. Four Numbers – Increase your chances of picking your numbers by betting on four numbers. Players win if any three of the four are rolled. This bet pays 7:1. These are the most common bets in a game of Sic Bo with the small and big bets being the most popular as they offer the lowest house edge at approximately 2.7%. Although this isn’t as low as a game of blackjack, the game is worth playing if you are after something new or different. Since the game isn’t as popular as its beloved casino game counterparts, it isn’t as common to see multiple variants at Internet casinos. Even then, it can be rare to find just one title. Some leading software developers haven’t even brought out a Sic Bo title, such as Net Entertainment, however there are a few top of the industry software developers who have. Microgaming Sic Bo – Microgaming offers a basic Sic Bo layout which pays homage to Chinese culture via the number style and the colour red. The top leading software developer makes betting easy with the option to bet small or big located in the top left and right hand corner, respectively, on the betting part of the Sic Bo layout. Just above the the small bet section on the green cloth interface is the table limit. In the bottom right hand corner, the area which still remains on the table, sees how much you can bet per click along with chip sizes. These range from one to 500. Below this, which is now off the table, are the three icons ‘Clear’, which allows you to clear your bets; ‘Repeat’ so you can repeat the same bet instead of putting it on again; and finally ‘Roll’ which you click when you are ready and have made your bets. Your balance is shown in the bottom left hand corner under the icon panel. For players who like a fast play version, Microgaming doesn’t offer an auto roll option to speed up the pace. You will find Microgaming’s Sic Bo at Royal Vegas Casino. Sic Bo by NYX Interactive – NYX Interactive allows you to alter the cloth colour from the classic green to the occasional red and even to a blue cloth table in their Sic Bo variant. It features all the same betting options as Microgaming’s version with the Sic Bo layout identical in terms of where the betting areas are. NYX has chips located in the bottom centre of the play screen ranging from 0.25 to 100. This version doesn’t offer the option to repeat your bets as Microgaming does. Additionally, your balance is located in the top centre of the screen. This version doesn’t offer an auto play function either. It does show you the dice history in the top right hand corner however so you can keep tabs on what was previously rolled. Play at Guts Casino. Playtech Sic Bo – Playtech offers the lowest betting chip out of the three with a 10 cent chip available right up to a $100 chip. This version features a ‘rebet’ and ‘clear bets’ option, which appear after you have played one hand. The layout is similar but the text is somewhat cramped so it can be hard to see what it says, which is quite a hinderance for a new player, but it can be fixed. In the bottom far left corner is your balance and on the right hand side there is a tool bar with an options button where you can enter full screen mode to see the text better, or even alter the audio. There is even an option to disable or enable the animation of the dice rolling when you click roll if you aren’t patient as it will adjust the game speed. This option is generally favoured by more experienced players. Overall, these three leading software developers all offer similar versions of Sic Bo and it comes down to the nitty gritty of your own personal preferences such as if you want a fast play option or if you want to make numerous bets using smaller chips.